2012 has been a successful year for Queen Elizabeth II. The Royal Family celebrated the Queen’s Diamond Jubilee in the United Kingdom and Commonwealth and presided over the successful London Summer Olympics, where the Queen’s granddaughter, Zara Phillips. This week, on November 20, the Queen and the Duke of Edinburgh celebrated their 65th wedding anniversary. The circumstances faced by the Royal Family in 1992 were very different. November 20 also marked the twentieth anniversary of the Windsor Castle fire, the crescendo of the Queen’s famous “Annus Horribilis.” The destruction of state rooms within the centuries old palace appeared to symbolize the impending collapse of the monarchy, and provoked a fierce debate about the financial situation of the Queen, her family and her properties. Windsor Castle was originally built in the eleventh century as part of the system of Norman fortifications designed by King William I to establish his rule over England following the Norman Conquest of 1066. The castle became a royal residence during the reign of William I’s youngest son, King Henry I, who celebrated his wedding to his second wife, Adeliza of Louvain, there in 1121. King John used the castle as his base for the negotiations with his barons that precipitated the signing of Magna Carta in 1215 and his son, Henry III, viewed the castle as his principal residence for himself, his Queen, Eleanor of Provence and their children. The castle was damaged and looted during the English Civil Wars of the 1640s. Following the Restoration of King Charles II in 1660, the King’s cousin, Prince Rupert of the Rhine, the first Governor of the Hudson’s Bay Company, received the post of Constable of Windsor Castle and was charged with the Castle’s refurbishment in the baroque style of another one of Charles II’s cousins, King Louis XIV of France. The castle was restored a second time during the reign of King George IV, who persuaded parliament to grant him £300,000 for refurbishment. (The equivalent of £245 million in twenty-first century terms). When George V decided to replace the Germanic surnames and titles within the Royal Family with English equivalents during the First World War, he was inspired by Windsor Castle and its illustrious royal history. One of England’s most popular and successful medieval Kings, Edward III, was born at the Castle and was known in his lifetime as “Edward of Windsor.” In 1917, the Royal Family became the House of Windsor, identifying themselves with the historic castle. During the Second World War, Windsor Castle’s reputation as a place that “could stand a siege if need be” was once again significant as the wartime home of the future Queen Elizabeth II and her sister Princess Margaret. 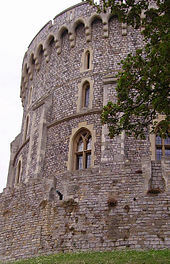 In contrast to Buckingham Palace, which was damaged by bombing, Windsor Castle survived the war unscathed and appeared to symbolize the continuity of the monarchy. Elizabeth II thought of the Castle as home and has resided there on weekends throughout her reign. 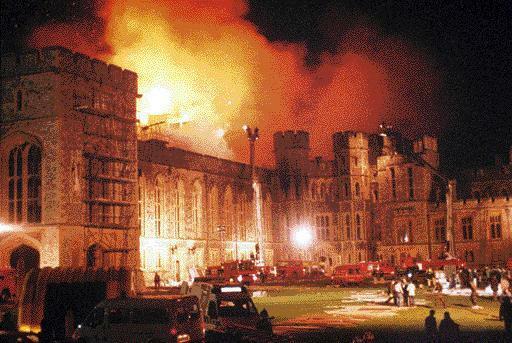 Windsor Castle’s reputation as a place of stability and continuity was shattered by the November 1992 fire, which destroyed nine principal staterooms and damaged a hundred more over the course of fifteen hours. There had been a number of prominent scandals within the Royal Family that year, including the separation of the Duke and Duchess of York, the divorce of Princess Anne and Captain Mark Phillips and the publication of Andrew Morton’s tell all book about the Prince and Princess of Wales’ marriage, Diana : Her True Story. The fire at Windsor Castle appeared to symbolize the breakdown of the Queen’s prestige and authority. 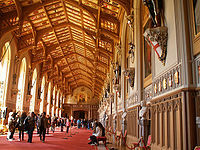 The restored St. George’s Hall at Windsor Castle after the 1992 fire. In contrast to King George IV, Queen Elizabeth II would not receive a parliamentary grant for the restoration of Windsor Castle. Prime Minister John Major’s proposal that parliament pay for the damages, as the castle is the property of the state was deeply unpopular and provoked widespread demands for changes to the monarchy’s financial situation. The monarch was called upon to restore Windsor Castle from her private revenue from the Duchy of Lancaster and to once again pay income tax. (King George VI was exempted from income tax in 1937, due to the unexpected expense of Edward VIII’s settlement after the 1936 Abdication). 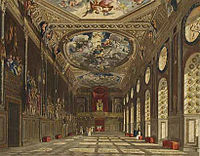 The Queen ultimately paid for the restoration of Windsor Castle through her own income and the revenue generated from opening the Buckingham Palace state rooms to the public. The Castle was reopened to the public in 1997. Although the 1992 fire at Windsor Castle marked the nadir of an already difficult year for the Queen, the aftermath of the disaster contributed the current popularity enjoyed by the Royal Family. 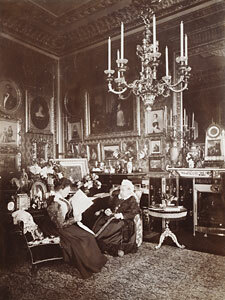 The Queen’s willingness to personally contribute to the restoration of the Castle and pay income tax was widely admired. The accessibility of Buckingham Palace after the fire allowed a wide audience to view masterpieces from the royal collection, earning the Queen a reputation as a “curator monarch,” willing to share the Royal Family’s cultural heritage. The Queen recovered from the “Annus Horribilis” of 1992 to become the acclaimed Diamond Jubilee Queen of 2012.